Computer Science is more than just computer programming. It is the science of solving problems with computers. The ability to think analytically and logically, design creative and robust solutions, work in a team environment, and continue to learn new technologies is vital to stay competitive in a constantly changing world. As computers are now a part of almost every electronic device the need for qualified computer scientists is greater than ever. Majors will solve problems using multiple programming languages, development platforms, and have a theoretical and practical understanding of the fundamental principles and concepts of computer science. Caring instructors provide a solid underpinning of structured thinking, and analytical reasoning that prepare students to solve complex problems as a team or as an individual. Graduates will be equipped with the problem-solving skills, practical experiences, and technical ability to succeed in the rapidly evolving digital landscape and find a career that suits their interests. This section lists the requirements of the CS major, provides a graphical illustration of the prerequisite structure of the major CS courses, lists sample student plans, and describes the senior oral which is an optional component of the major. Qualified majors may additionally participate in the honors program, which is described in the next section. 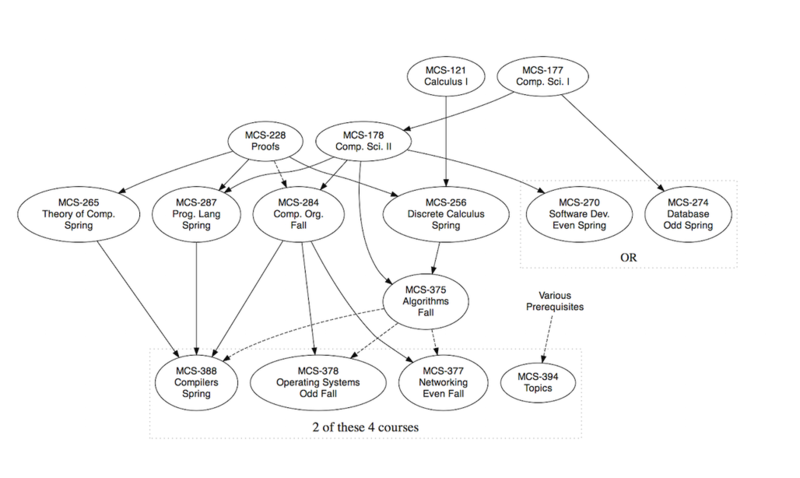 This diagram shows the prerequisites structure of courses in the CS major. Solid lines connecting two courses indicates that a course is a pre-requisite while a dashed line connecting two courses indicates that a course is a co-requisite. MCS-355 Numerical Analysis (Spring odd years) or MCS-358 Mathematical Model Building (J-term even years) can be taken in place of one of the two electives. A grade point average of at least 2.3333 in the following four courses. An additional course from the list in requirement 2. Each student should ideally lay out a schedule of their own showing what courses they plan to take when. This schedule may not accurately forecast the future, but it is helpful nonetheless. The sample plans below are a useful starting point in developing such an individual plan. You can select the sample plan that comes closest to fitting your own situation and then tailor it as necessary. Note that these sample plans show only courses within the Math and Computer Science Department, but in some cases exceed the requirements of the major. While the course plans don't include MCS-355 and MCS-358 (since they require math prerequisites), the courses can be used to fulfill the fifth requirement listed above. In order to graduate with honors in computer science, a student must complete an application for admission to the honors program, showing that the student satisfies the admission requirements, and then must satisfy the requirements of the program. Completion of MCS-119 or MCS-121, MCS-177, MCS-178, MCS-228, MCS-256, MCS-265, MCS-284, and MCS-287 with a quality point average greater than 3.14. Attainment of a quality point average greater than pi in courses used to satisfy the requirements of the major. If a student has taken more courses than the major requires, that student may designate for consideration any collection of courses satisfying the requirements of the major. Computer science honors thesis proposals should be written in consultation with the faculty member who will be supervising the work. The proposal and thesis must each be approved by the Computer Science Honors Committee. These guidelines are intended to help students, faculty supervisors, and the committee judge what merits approval. The thesis should include creative work, and should not reproduce well known results; however, it need not be entirely novel. It is unreasonable for an undergraduate with limited time and library resources to do a thorough search of the literature, such as would be necessary to ensure complete novelty. Moreover, it would be rare for any topic to be simultaneously novel, easy enough to think of, and easy enough to do. The thesis should include use of primary-source reference material. As stated above, an exhaustive search of the research literature is impractical. Nonetheless, the resources of inter-library loan, the faculty supervisor's private holdings, etc. must be tapped if the thesis work is to go beyond standard classroom/textbook work. Many computer science theses include some system-building effort (typically programming, though hardware construction is possible). However, this kind of work is neither necessary nor sufficient. There must be some more theoretical, conceptual, or empirical side to the work. A typical thesis might involve the practical application of a theoretical concept. Other theses, however, are purely theoretical. Occasionally, a thesis may be based on empirical, rather than theoretical, foundations. For example, the quantitative performance of a system might be measured. This kind of thesis should be approached with caution, as empirical work has many pitfalls and can therefore be difficult to complete on a tight time schedule. The written thesis should sufficiently explain the project undertaken and results achieved that someone generally knowledgeable about computer science, but not about the specific topic, can understand it. The quality of writing and care in citing sources should be adequate for external distribution without embarrassment. The thesis must contain a substantial computer science component, though it can include other disciplines as well. If a single thesis simultaneously satisfies the requirements of this program and some other discipline's honors program, it can be used for both (subject to the other program's restrictions). However, course credit will not be awarded for work which is otherwise receiving course credit. The Computer Science Honors Committee maintains a file of past proposals and theses, which may be valuable in further clarifying what constitutes a suitable thesis.